When? It was probably 1980 or 1981, it could have been later, but by then we were living in Pittsburgh. Where? It was probably Woodfield Mall in Schaumburg. I don’t remember the exact circumstances, but I do remember the emotion. I don’t even remember who I was with when I first saw it — maybe Mom and Aunt Ginny. All I really remember is walking past the window and seeing the painting and having a powerful feeling of sadness, but also a feeling of desire. I wanted to own the painting. I must have talked to Dean who probably reluctantly agreed to visit the Merill Chase Gallery in the mall to see if he wanted to own it too. I do remember going into the gallery and telling a Merill Chase employee that we were interested in purchasing the painting in the window. The employee showed us a small room with a sofa or comfortable chairs and invited us to sit while she had the painting brought to us and placed on an easel. She left us alone for a few minutes while we talked about it. I explained why I liked it. I don’t recall Dean’s responses. I really wanted it. It was not too expensive, as I recall something we could afford, but not easily. It turned out that the painting was actually a serigraph and came with a certificate of authenticity. We bought the serigraph and it hung in the living room of our Pittsburgh apartment. It must have hung in our Alexandria homes — in places where visitors could see it. For many years it hung above our bed in Bethesda. One night Clare and Andrew asked me the story of the painting. Since I didn’t know the actual story, I made one up. I don’t remember exactly what I said, but it had something to do with the merry-go-round being magical so the horses could still run on it but one horse wanted to run free and jumped off the carousel, only to freeze a few hundred feet away from the merry-go-round. No happy ending. I think it made the kids very sad. Once I realized that the Internet knew everything, I looked up the artist, Robert Addison. I found a few things about him. His other work was often as depressing. 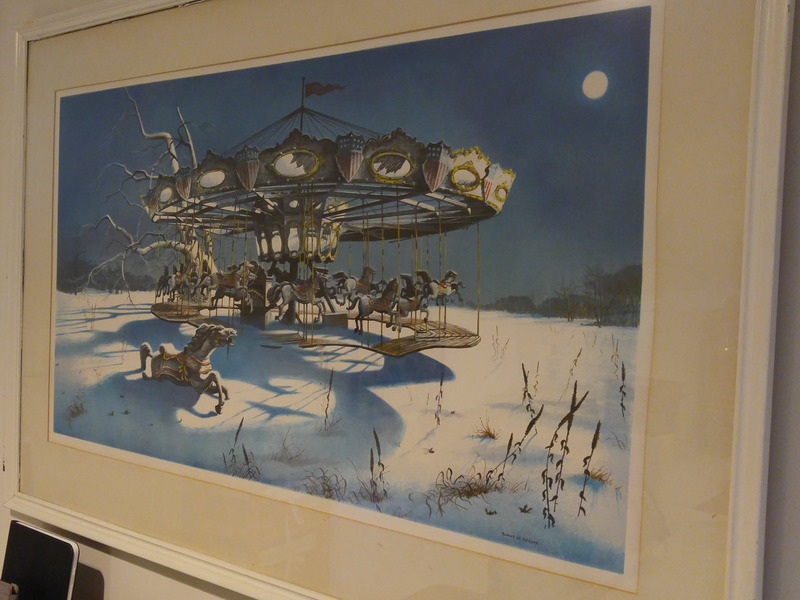 The merry-go-round in my serigraph is featured in some of his other work. Its origin is based on seeing a bombed out merry-go-round when he was stationed in England during World War 2. The painting was completed in 1979. I think he did two versions of it because there is mention of “Moonlit Merry-go-Round, II” on the Internet. More recent searches have found that Dennis De Young from Styx used Moonlit Merry-go-Round on an album called One Hundred Days from Now. Once I established my attic office the painting was taken there. I think it makes Dean sad, and he doesn’t really like it — I don’t think he ever did. But I do, I still do. Only I ever see it now — or Dean when he comes to the attic. Very rarely do guests visit the attic so, the only actual piece of art (by an artist who is not a friend or family member) is hidden away for only a few sets of eyes. And that makes me sad. I’m glad though that you get to see the piece of art you have loved for so long, and that you get to see it almost every day. I also am very jealous of your attic. 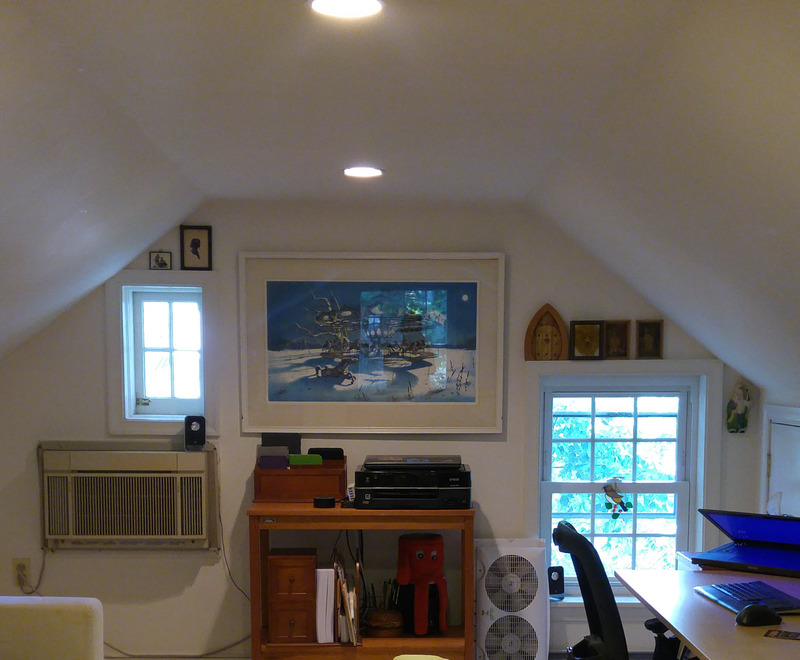 My attic-like office isn’t nearly as nice. You are right, I do see it every day, but I also forget it is there. I am very lucky to have my attic office. I love it. Your reaction to this painting is almost exactly like mine. I first saw it at the Merry-Go-Round museum in Sandusky in 1990. I never forgot it and I was just able to purchase a copy recently. It is haunting, isn’t it? I am glad you were able to purchase a copy of the print. I didn’t know Sandusky had a Merry-go-Round Museum. I’ll have to visit someday.